I previously analyzed how much my 150,000 Verizon Smart Rewards (points) were worth (Part 1) (which you should read before this post) and they’ve grown in the meantime to a quarter million. I concluded that by buying gift cards for about a 10% discount or by booking hotels through the Verizon Smart Rewards portal, you could receive about one cent per point as your best redemption value for Verizon “Smart” Rewards. Since then, I’ve found a few ways to exceed the one cent per point value, but these methods still require you to spend some of your own cash to get the discount. Los Amigos is a restaurant located nearby (the distance marker is incorrect). 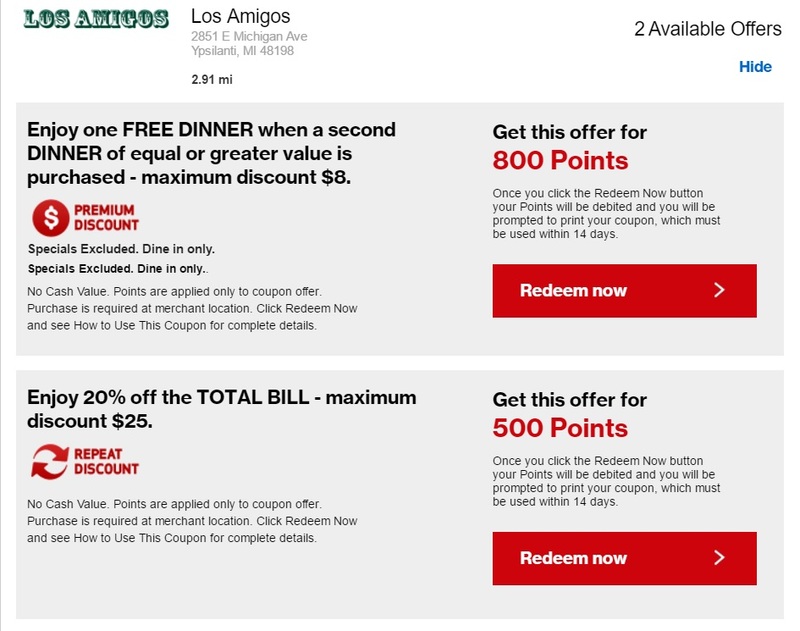 Two offers are available: 1) spend 800 points for a free dinner up to $8, and 2) spend 500 points for 20% off your total meal up to $25. The first offer provides a maximum redemption value of 1 cent per point but the second offer provides a maximum redemption value of 5 cents per point! You only get the full 5 cents per point if your bill is over $125, so your mileage may vary. Sometimes Smart Rewards puts up something a decent Daily Deal, but typically you’ll get one cent per point. The biggest advantage with Daily Deals is the savings %–you may need to pony up less of your own money. Some deals reach 100% savings but I have not found any that appear valuable. Maybe other folks read Bon Appetit? It may be possible to buy gift cards–for example, the $50 Jiffy Lube gift card for $45–and then use that gift card to pay for a coupon that you secured through a local deal–for example, 500 points for 10% (up to 5 dollars) off your oil change. I did not find any examples of gift cards and local deals offered by the same merchant, but it’s worth checking. If these two redemption options existed, you could save $10 (or 20%) off a hypothetical $50 oil change. Each point would still be worth one cent though. If I was going to book a cruise, I would probably book on http://aa.cruises.com/ to secure either airline miles or free upgrades for my purchase. I’ll compare a cruise searched through Verizon with the same cruise searched through American Airlines Cruises. Interestingly, both programs give you the same price which means you receive no cents per point for using Verizon Smart Rewards. Here is the same cruise searched through the American Airlines Cruises portal. 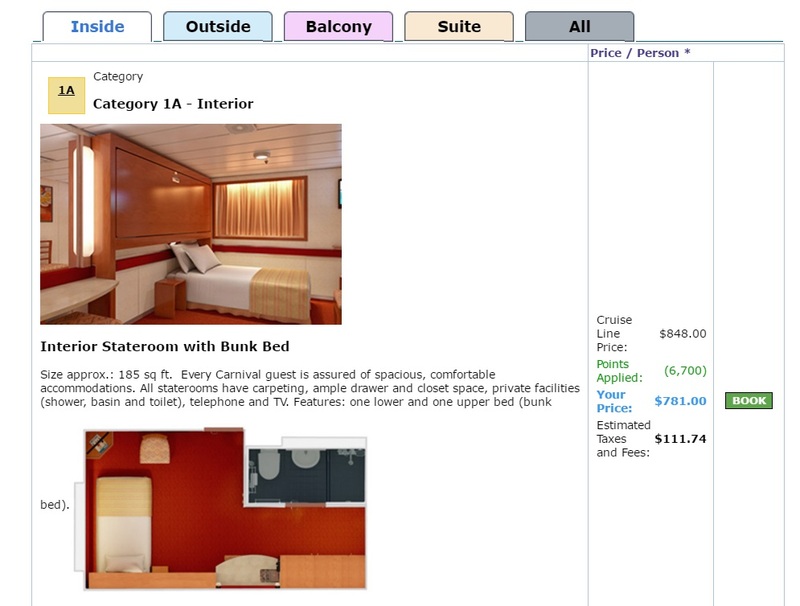 The Interior and Suite rooms are the exact same price, but the Oceanview and Balcony rooms are slightly more expensive. The American Airlines Cruises booking comes with cool bonus offers that are included in the screenshot. I did not see any option to redeem Verizon Smart Rewards, so I continued through the booking. After you pick your room, it will give you an option to redeem Verizon Smart Rewards at one cent per point for a 10% discount. It appears the site automatically limits you to one cent per point. You can save 10% but you lose extra miles, on-board credit, and triple miles that come with a booking on the American Airlines Cruises website. You’ll need to do the math yourself to see which site makes sense. If anyone has other recommendations for cruise booking sites, please let me know in the comments. Verizon Smart Rewards are not entirrrrrely useless, but they are definitely not my preferred loyalty program. Unless a store near you is running a local deal that you can maximize, you are likely not going to earn over one cent per point. To answer the initial question, my 250,000 points are likely worth $2,500. 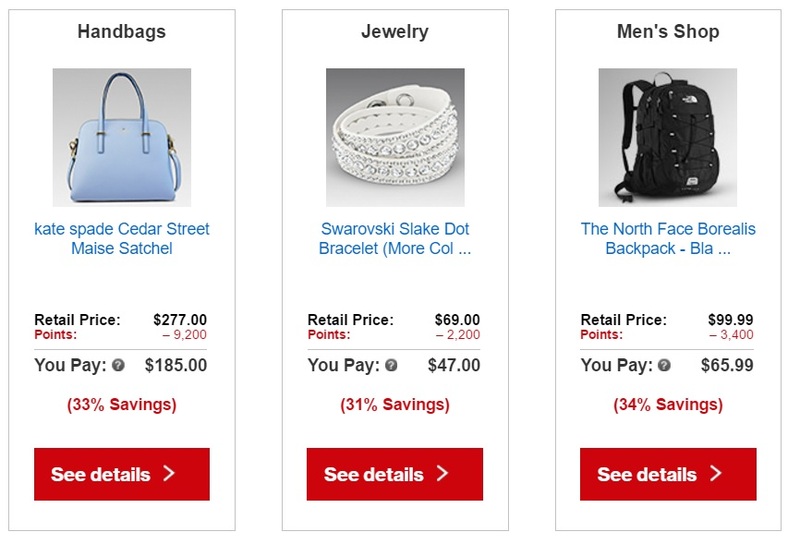 4 Comments on "Verizon Smart Rewards: How Much Are My 250,000 Points Worth? (Part 2)"
Good luck! It would be sooo nice if we could simply redeem those points for cash, even at $0.005 per point. My sister has accumulated enough points for 4 days,3 nights at a hotel in Florence for 2. It also includes 2 excursion days. It appears to be a good deal but I’m a little skeptical about the out of pocket that may be hidden or that the trip isn’t quite what is appears. She would like to surprise our Mom for her 80th birthday next year. Her points are expiring May 1 so she has to make a decision ASAP. Any advice? I don’t think that’s the type of trip that can be booked with Verizon points, less if she first redeemed them for gift cards?